You'll be £20.00 closer to your next £10.00 credit when you purchase Secret Service in the Cold War. What's this? The Second World War had been won, but relationships between the Western allies and the Soviet Union were becoming increasingly strained, as the nuclear arms race made world peace precarious. It was vital that Britain knew the Soviets’ intentions and military capabilities, both offensive and defensive. 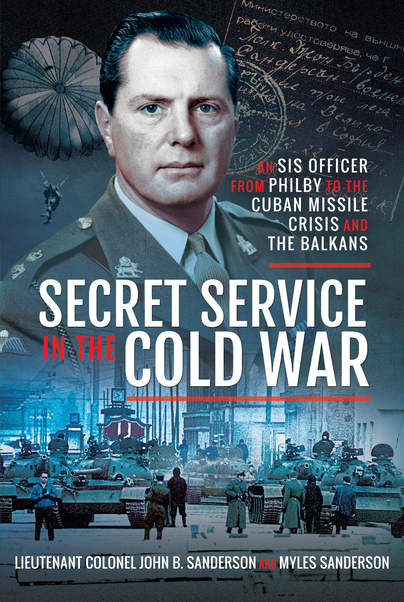 As a Military Attaché in Sofia, and Commandant of an Intelligence Centre in the Balkans, it was SIS officer Colonel John Sanderson’s job to find out. Sanderson handled agents who operated secretly behind the Iron Curtain at the height of the Cold War and organised hidden arms depots for stay-behind agents in case of a Red Army invasion. Based on Sanderson’s letters and personal accounts of his time with MI4 and MI6, we learn how he was sent to observe sessions of the Paris UNO Security Council in 1948 and to recruit émigrés for infiltration behind the Iron Curtain, into Communist Bulgaria. Fluent in French and Bulgarian, in 1949 Captain Sanderson was posted to Sofia as a Press Attaché with diplomatic immunity, reporting on the Communist show trials. Colonel Sanderson returned there twelve years later as the Military, Naval and Air Attaché. In 1961, having been tasked by London with photographing the latest MIG fighter, he was driven at night to Sofia airport’s perimeter by a CIA colleague. Closely followed by the Bulgarian secret police, he parachute-rolled, unobserved, out of the car with his camera. Arrested at daylight, he escaped to the border and drove across Europe, still pursued by the ruthless Bulgarian Security Services. John Sanderson’s early service life was equally challenging, from helping defend Britain’s coastline in 1940, picking up shot-down pilots around Dover on a motorbike during the Battle of Britain, to fighting the Japanese in the Burmese and Indian jungles, before returning to London to join the Secret Intelligence Services. In parallel with Sanderson’s SIS career, living with Russian émigrés in Paris, posted to SIS headquarters in the Berlin Olympic stadium, and later working together in the Intelligence Division of NATO headquarters Paris during the Cuban Missile Crisis, was his SIS friend RAF Squadron Leader John Aldwinckle, a veteran of SOE wartime operations in Halifax bombers. All Aldwinckle’s agents were betrayed by the traitor George Blake, as were all Sanderson’s by Kim Philby. In John Sanderson’s biography we get the detailed inside story of the Berlin Air Lift, the Suez Invasion, the Cuban Missile Crisis, and the fall of the Berlin Wall. We see the results of Philby and Blake’s treachery and the effects which the courageous actions of the two ‘Olegs’, the Russian Colonels Penkovsky and Gordievsky, had on the international politics of Khrushchev, Kennedy, Gorbachev, Thatcher and Reagan – and the consequences their decisions had for the course of world history. For over thirty years, John Sanderson worked for the British Secret Services – with his last mission, aged 74, as exciting as his first, being helicoptered into Sarajevo with an SAS team at the height of the Balkan War. The book has an impressive bibliography, sources and notes together with a comprehensive index. There are in all 33 chapters written by Myles based on his father’s archives, letters and verbal accounts. As a regular soldier and intelligence officer he has an impressive career aided by being fluent in four languages. From the biography of John B. Sanderson, written here, we learn more about the Berlin Airlift, the Cuban Missile crisis, the Suez invasion and the fall of the Berlin Wall. Kim Philby features as the treacherous mole inside British intelligence and how the recruits of émigrés to work secretly behind the Iron Curtain, organised by Sanderson, were betrayed by Philby. George Blake is said to have betrayed 500-600 British Agents to the KGB and knew that the KGB or Stasi would summarily execute most of them. The author says for over three decades John Sanderson worked for the British Secret Service, with his last mission being as exciting as his first – sent into Sarajevo with a SAS team at the height of the Balkan War. He certainly played a small part in bringing peace to Bosnia and the Balkans, a region he had first known in 1949. As a result of this his last secret action, unrecognised officially, he probably saved many lives. Most of us will find the detail of the secret world of MI4, MI6 and the secret service highly intriguing and I hope that a read of this book will open up some of the behind the scenes actions to various political topics. I found myself engrossed in Myles Sanderson’s book to the extent that I have read it through from cover to cover. I found it an interesting AND pleasurable read. The author has managed to turn the great variety of sources into a coherent whole. But the jewels in the crown are to be found in the original material from family, friends and colleagues.The letters, articles and diary entries humanise this covert world. A great book. I loved it. Having seen and lived « on the other side » and dreaming of freedom day in and day out during the cold war I found new and fascinating angles to many of the most famous once secret episodes of the second half of the 20th century. Great inside looks to the spy stories from Kim Philby to Oleg Gordievsky. It gives both a background to understand what goes on in the « big game » as well as a more intimate look from an insider. The personal stories and letters to the family describing everyday life give a real feel of the era and a human touch to the thriller part of the book. Thank you, John Sanderson. For the book and for your extraordinary work from the battlefields of Burma in the 2nd World War to helping to bring down the iron curtain in the cold war to Bosnia in the 1990s. A true testimony of courage and a life dedicated to his country and the cause of freedom. Five stars. The author the son of the subject of this book, has accomplished a first-rate job in rescuing his father’s extraordinary eventful life from obscurity and setting the man and his achievements in the context of his time. Obscurity and anonymity is normally assured following a life of action and great interest when working for the Secret Intelligence Service or MI6. This is therefore an unusual account of the experiences of a soldier who post war becomes involved in secret work with SIS working under the cover of military attaché. The milieu within which Sanderson operated as a member of the embassy staff is covered in some depth, encompassing post war threats with ever increasing dangers, evolving into the Cold War. Much of the source material for the book came from two well travelled and battered metal trunks found in John Sanderson’s shed after his death. There were many photographs, letters and documents covering his military, personal and diplomatic life allowing a full history of events he witnessed to be told. These time capsules were only noticed and opened after his death. Not surprisingly there are many gaps and silences simply because the world of the SIS was by definition “secret”. The work has been enhanced by the assiduousness of the Sanderson family in communicating their thoughts so clearly in letters to each other throughout the Second World War and the Cold War a source well used in the book. A graduate of London and Brunel universities, MYLES SANDERSON taught Design Technology in Australia and the UK. Myles spent his childhood in Turkey, Sudan, Egypt, Cyprus, Communist Bulgaria, France, Germany and Holland, where his father was posted in diplomatic, intelligence or military roles. Since 2006 he has lived in Paris, researching and writing history. Myles has written articles for National Trust Australia magazine, broadcast in French on Paris radio, and presented a ‘France 2’ TV news report on an Australian Imperial Force relative killed in 1917. Recently, Myles gave a talk in the Arras caves on the New Zealand Tunnelling Company to the New Zealand ambassador, Military Attaché and other service personnel. Myles is a qualified SCUBA wreck diver.